NAMM 2019: Fender has unveiled its new hand-wired signature ’62 Princeton amp for Chris Stapleton. The 'brownface' '62 Princeton was known for its studio prowess. 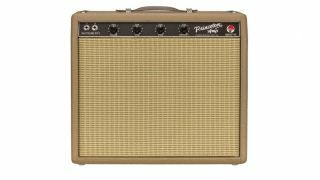 Revamped by Fender after the Fifties for use in lower-volume performance spaces, it proved ideal in the practice room and at recording volume. The new ‘62 Princeton Chris Stapleton Edition takes that hand-wired 6G2 circuit and recreates it, adding an Eminence 12" Special Design 'CS' speaker and an output tube-biased tremolo circuit. The original's dark brown 'radio knobs', pine cabinet and textured brown vinyl are faithfully re-created in the Stapleton Edition. The amp also features an engraved brass plate with Stapleton's signature placed on the rear panel.